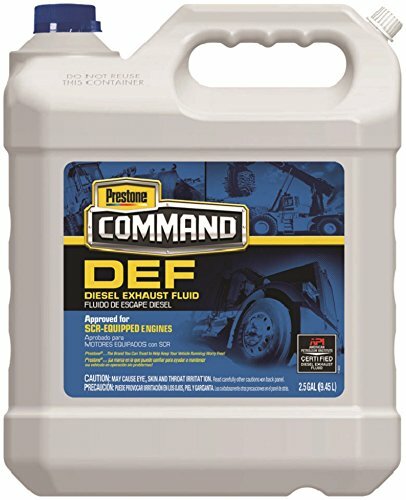 Prestone Command DEF is formulated with high quality urea and demineralized water to work with ALL SCR-equipped diesel engines. Prestone Command DEF is a safe, easy-to-handle nontoxic solution of 67.5% water and 32.5% automotive grade urea. It is a stable fluid that is colorless and odorless. Diesel Exhaust Fluid (DEF) is a consumable and essential fluid for maintaining Selective Catalytic Reduction (SCR)-equipped modern diesel engines. SCR allows the engine manufacturer to tune the engine for increased fuel efficiency while remaining in compliance with Federal emissions requirements. Prestone Command DEF usage will vary by vehicle. Most OEMs estimate usage will be 2-3% of diesel fuel consumption. On average, this amounts to one gallon of DEF to every 50-75 gallons of fuel. Check owner’s manual for proper usage in your vehicle. DEF reacts with certain metals such as aluminum, copper, and brass. Therefore, only place DEF in storage tanks and dispensing equipment made of stainless steel or high density polyethylene.